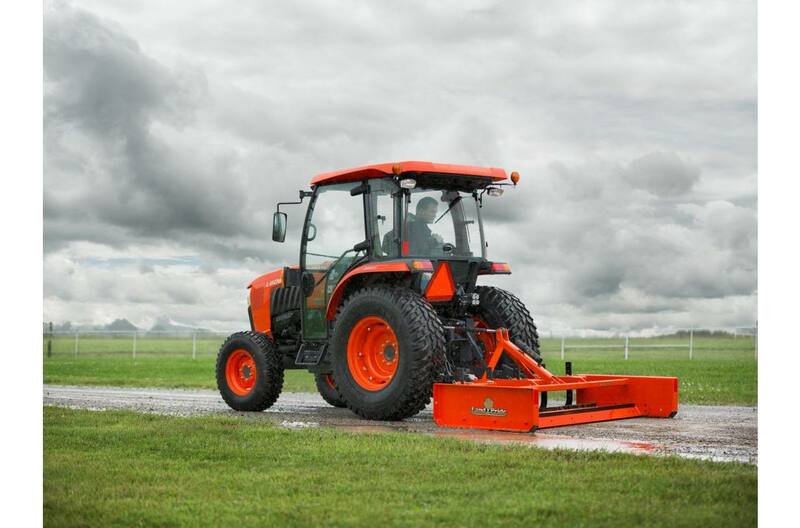 Land Pride's GS15 Series Grading Scrapers have uses in applications such as landscaping, small farms and ranches, hunting camps, large estates, small acreages, and sod farms. 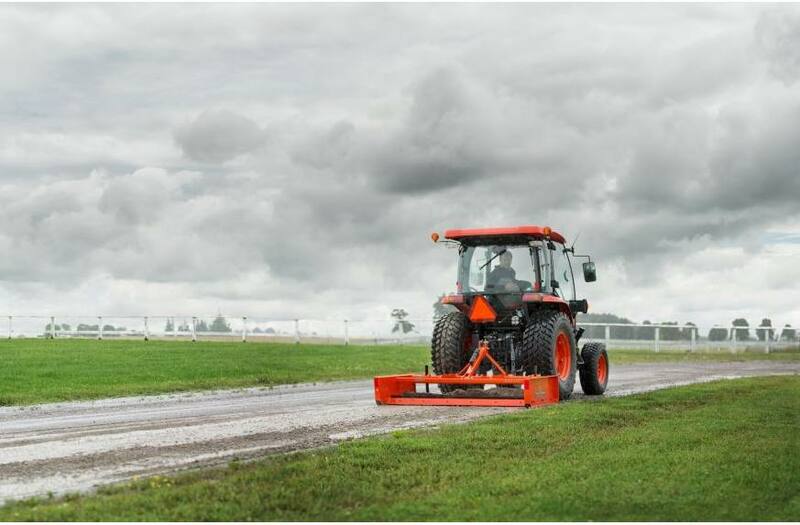 The GS15 is extra user-friendly and a low cost alternative for road grading applications. Unlike a box scraper, they are not designed to transfer large volumes of dirt from one location to another and as a result do not require the additional horsepower that a box scraper normally requires. Nor does it require the tending of tractor 3-point lift controls to maintain grade that a box scraper might require. Cat. 1 and Cat.1 Quick Hitch compatible. Has lower hitch clevis type mountings: Makes for faster and easier hookup to the tractor. 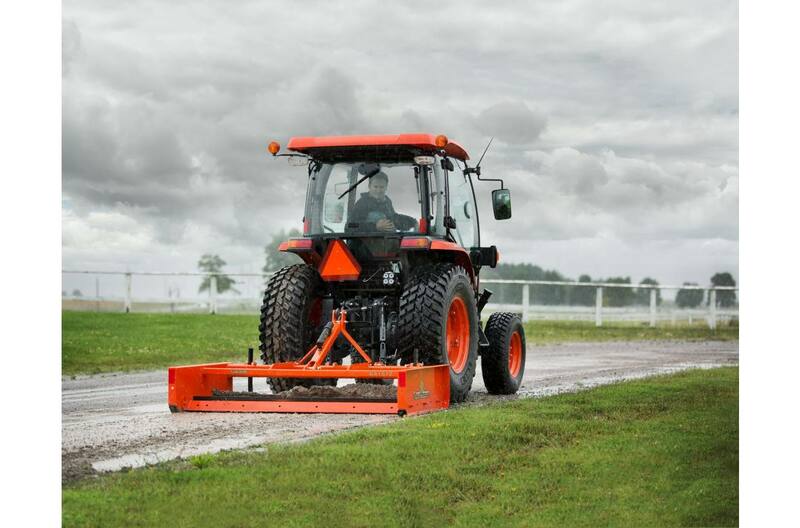 20-50 hp requirements with 48" working width 25-50 hp requirements with 60" & 72" working widths: Makes it compatible with many popular smaller sized and properly ballasted compact utility tractors in use today. 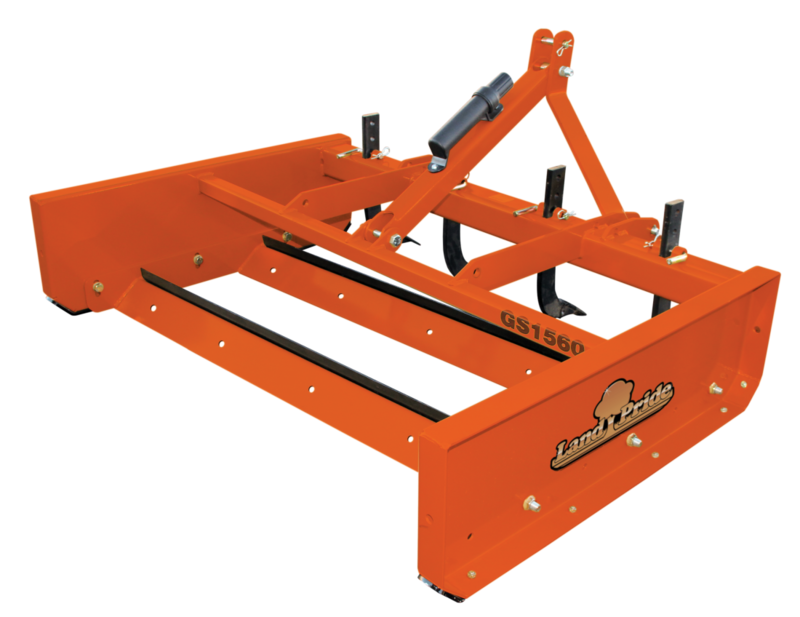 Dual adjustable height grading blades and optional 4-position scarifier shanks: Allows the scraper to be adjusted to desired amount of cultivation, leveling, and grading action. Reversible heat treated high carbon steel grading blades: For excellent wear resistance and long service life. Hardened tips on optional scarifier shanks: Assures long service life. Replaceable and full length heavy gauge skid shoes: Makes for easier operation and long unit life. Reversible skid shoes: Extends the life of the skid shoes. Heavy duty frame construction: Assures long lasting reliability and performance. Available in Land Pride Beige or Orange Paint: To meet customers preference. Side panel thickness: 3/16 in. (5 mm) Thick with 2 3/4 in. formed edges. Front main beam & scarifier Support: 4 in.x 4 in. x 5/16 in. (10.2 cm x 10.2 cm x 0.8 cm) Reinforced heavy wall tubing. Rear beam construction: 2 in.x 2 in.x 3/16 in. (5.1 cm x 5.1 cm x 0.5 cm) Heavy wall tubing. Skid shoe dimensions: 3/8 in. (10 mm) Thick x 2 3/4 in. (7.0 cm) wide x 44 in. (1.12 m) long. Scarifier shank construction - Optional: Heat treated 4-position shank with dimpled-on hardened tips. Cutting edges: Two 1/2 in. x 6 in. (1.3 cm x 15.2 cm) high carbon heat treated blades that are reversible and replaceable. Cutting edge placement: Two parallel grading blades positioned at a 5 deg. grading angle with 17 1/2 in. (44.5 cm) fore and aft spacing in. between leading edges. Cutting edge adjustment: Infinite vertical adjustment from level grade to 1 1/2 in. (3.8 cm) below grade. Shank adjustments: 3 1/2 in. and 1 1/2 in. (8.9 cm and 3.8 cm) below grade level. 1/2 in. and 2 1/2 in. (1.3 cm and 6.4 cm) above grade level.